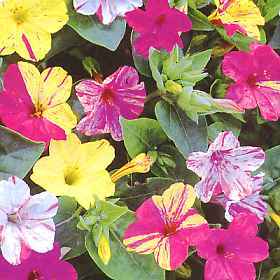 As you can see by the picture (above), these flowers come in an abundance of bright and vibrant colours. They are naturally tubular, but these can always be made with the cupped effect. To begin, gather five stamens together - these have varying lengths - one long, 2 medium, and 2 shorter. Tape these together onto a wire cut to 2" long. Roll your moulding paste very thin, and cut out flowers. Using your fingers, gently rub the edges of the petals and then flute generously (I use a rounded toothpick). Place face up on soft foam, and press firmly in the centre with a ball tool. To create a more tubular effect, press first with a large tool, then with a medium, and then finally a small ball tool. This way the icing will gently stretch, rather than splitting. The petals will lift, and fall into a natural looking appearance. Paint a fine coat of royal icing from just above to just below the tape holding the stamens. Rest the flowers on a holed board, and push the stem through until only the stamens and no tape shows. Allow to set. 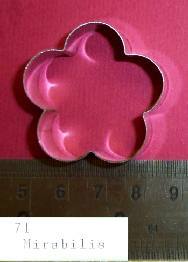 For a really tubular effect, colour royal icing to match, thin it slightly, and paint on to the bac of the flower and a little way down the stem. Once this is dry, paint on a green calyx in the normal way. If you wish, the ends of the stamens can be trimmed off and a touch of very thing royal icing in your choice of colour brushed on the tips. This will give a more delicate look. As a variation,you are able to simply omit the tubular stage, and paint on a green calyx with royal icing where the stamens go through the base of the flower.